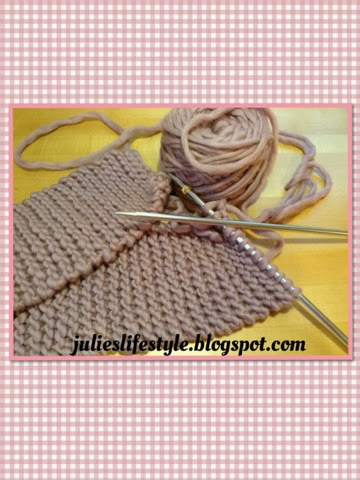 I love knitting, crocheting and reading, and recently I discovered a blog that has just that! The blog is called Small Things run by Ginny and you can find her blog HERE. Ginny has a blog party on Wednesday called Yarn Along where you can share both what you knit/crochet and what book you are reading. I would like to share with you my knit project and book I'm reading. This is my work in progress knit infinity scarf. The yarn I am using is thick and the needles are US size 11 and I casted on 13 stitches. The yarn is Twinkle Hand Knits Soft Chunky in the color 52 Dusty Pink. I need to make this scarf long and I have used 1 skein and then added another skein to that. I want to be able to have the scarf wrapped around the neck two times. This is the book I am currently reading that my mom bought for me at a yard sale for 25 cents. 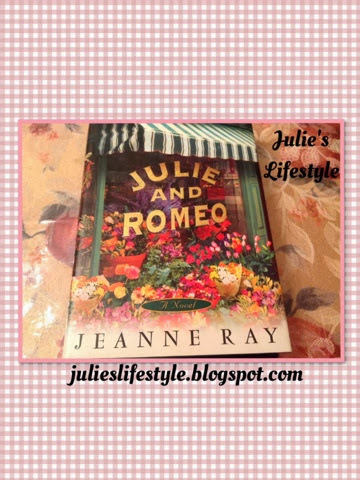 This book is a love story between two people that come from families that each own florist shops and are enemies and feuding with each other. I like the book and I am towards the end of reading it. I am curious to see what happens at the end of the book with both families. My mom and I also like the fact that the girls name in the book is Julie! I will also be sharing my work in progress with Tami's Amis Work in Progress Wednesday. I am new to her blog party and I will be attending other parties this week as well. Tami's Amis has on Fridays a blog party called Finished Object Friday too. I will be sharing this at My Merry Messy Life & Moogly party - Hookin On Hump Day. I look forward to finishing this scarf I'm working on and the book. Maybe some of you who like to knit/crochet will be interested in joining along at these parties I mentioned. It looks like it will be a wonderfully cozy scarf! :-) I love scarves that wrap around multiple times. The scarf is very pretty and looks like it will do a great job keeping out the cold, especially wrapped around several times. Has it snowed there yet? Love the dsusty pink and it looks like it will be warm and cozy on a cold winter's day! Do you get much snow where you live? Hi Julie! I can see your multi talented with yarn, you not only crochet but you knit also. You asked me about the baked potatoes, I just wash them, wrap them in foil and with a fork poke some holes and throw them in the crock pot. If I put them in late morning then they're nice and tender by suppertime. I set the crock pot on high and they're perfect every time. Looks like it's going to be a lovely scarf. I've seen that linky around and really enjoy reading what people are making/reading. Thanks so much for sharing. Hi Julie, the scarf will be beautiful. The book sound like a fun and easy read. Great title! lol! I have that book and I love it. Your scarf looks great. Warm and cozy. I don't know what I would do without scarves in the winter! This one looks chunky and warm :). I love the color of that scarf, it must be awesome! Thanks for pinning my post Julie!